The rolling hills around Sebastopol and Petaluma proved to be fertile farmlands for Japanese immigrants beginning in the 1880s. Although a handful of Nikkei owned commercial businesses, most worked the land. Some owned apple orchards or apple dehydrating plants; others grew grapes, berries and hops or raised the chickens on which the area prided itself. Over 750 people of Japanese ancestry resided in Sonoma County at the start of WWII, primarily in and around Sebastopol and Petaluma. We were fortunate to have assistance with our survey from Katherine Petrin, of the San Francisco firm Architectural Resources Group. Local Nisei served as knowledgeable and generous guides. The Sugiyama siblings and Alyce Yamasaki Sugiyama drove us around while sharing youthful memories of growing apples, raising chickens and community life. Enmanji Buddhist Temple has a remarkable history. Built as a Japanese exhibit hall for the 1933 Chicago World’s Fair, the structure replicates the style of an 11th century temple. Offered to members of the Sonoma County Buddhist Church after the fair closed, the building was dismantled and shipped to Sebastopol, where it was reassembled and dedicated with a traditional Ochigo procession in 1934. A panoramic view of the Temple dedication can be found at the Japanese American National Museum website. 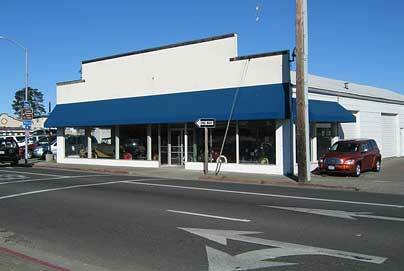 Now a car dealership showroom, 123 Petaluma Street was the address for the Asahi Grocery in the years before WWII. In addition to providing a store that sold Japanese goods, the Hamamoto family allowed several Nikkei who migrated with local crops to use their store as a mailing address. The Matsumoto ranch still holds the family's 1920s bungalow, remnants of a Japanese-style garden and numerous outbuildings including several chicken houses. One of the largest Japanese-owned chicken operations in the area, many of the historic chicken houses still stand on the Matsumoto ranch. Our Petaluma-Sebastopol guides - from left: Isako, Norma, Marie and Harry Sugiyama and Alyce Yamasaki Sugiyama. Built in 1897 for prosperous farmer James Redman, this house and the farmlands around it were purchased by the Hirahara family in the 1930s, who resided here until the late 1980s. The Hiraharas managed to maintain ownership of the farm during WWII interment. Petaluma's Enmanji Temple, 1934. Courtesy of Sonoma JACL's GIRI Project. Dr. Hiura ran his dental office in downtown Sebastopol from the upper floor of this building, which housed a pharmacy below. Our Nisei guides to the area remembered that Dr. Hiura moved a few blocks west before WWII and had an office in a medical building shared with non-Nikkei. The Hirooka family began clearing land for their egg ranch in 1915. The parents had worked on Hawaiian sugar plantations and as laborers picking hops, grapes and olives in Sonoma County before leasing the land for their own business outside Petaluma. With help from a neighbor, the Hirookas added chicken houses and the packing shed above during the 1920s and '30s. All eight children helped with the work, rising early to mix the chicken feed before school and gathering eggs twice a day. Youngest son Mitsuo (Johnny) Hirooka is still remembered as a football star and senior class president at Petaluma High School in 1939.